Thanks to Jess Ragan for his help in creating this guide! Phillips head screwdriver with a long thin neck that can reach the Saturn’s case screws. A copy of a Saturn game for testing purposes. Keep your chip safe by leaving it in the anti-static bag that I ship them in. Turn the Saturn right side up. Look at the twisted white ribbon cable running from the center of the system to the shiny metal box on the right hand side. Part of the ribbon will be taped to this metal box. First peel the tape off the metal box, then gently unplug the right end of the ribbon cable. Take this end of the cable and plug it into the connector on the modchip as pointed out below. Plug the chip itself into the plug where the lens cable was. If the chip does not plug in easily, you may need to file down the side edges of the plug in order to give it a better fit. Below you can see the linking (soldering) points of the two cables from the IC chip towards the motherboad. You can also see how the lens cable is to hooked up to the chip. A close-up shot of both solder points follows in the next steps. You may need to add some extra wire to extend the link cables’ reach across the machine. Take the end of the jumper cable and plug it into the second pin from the top (on the back of the unit) even if you see 5 pins instead of 4. (It’s the one marked 5VA — if one does not work, try the other). 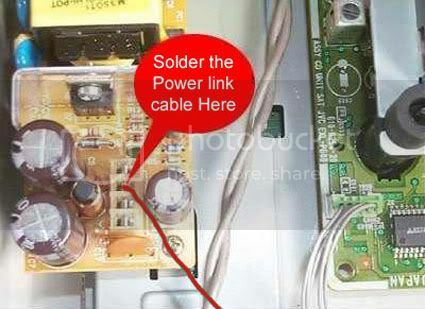 Please note the power wire MUST solder to the power socket directly! The original way was to solder the signal (blue) wire to pin 14 of the 32-pin chip. 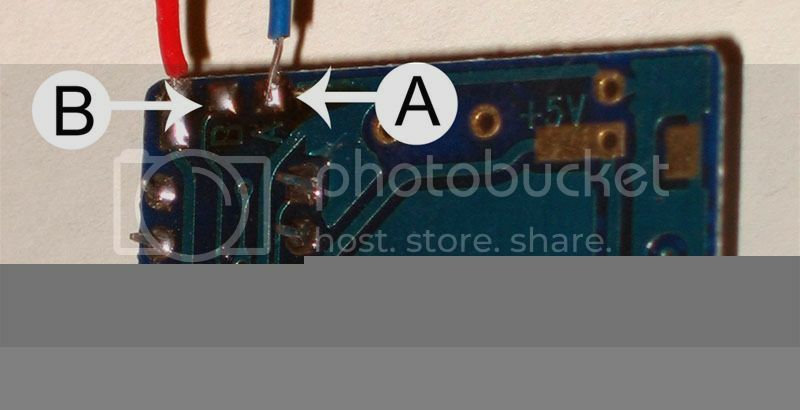 You can get rid of the signal cable altogether and link the signal point to point B with a bit of solder instead of linking to pin 14 of the 32-pin chip. Tape it down onto the shiny metal box so the ribbon and tape hold the chip in place. Secure the ribbon with a few more pieces of tape, because you never can be too sure. Before you put the case back onto the Saturn, make sure everything is ready to run. Is the mod chip taped down well? Once everything looks good, re-assemble your Saturn case. The disc should play just like a real Saturn game. If not, you’ll need to open the Saturn again and see what you did wrong. Instructions have been re-worded and organized in order to be clearer and more unique, as requested. The modchip arrived OK here in Brazil! Just a tip: the A< ->B jumper to substitute the “blue” connection to pin 14 have not worked in TecToy’s brazilian Saturn. All Sega products are reassembled and sold here by TecToy. It’s a “model 2″, with a 21 way flat, 32 pins chip and round buttons, but needed the wire from “A” to “pin 14″ to work. No happy A-B jumper here. Great job this little modchip. I’ve just received it (7 days for transatlantic shipment), installed it and unleashed the Saturn’s capabilities to read CD-R.
Do I need to solder the power link cable or can I just place it where it belongs? It’s possible to just wedge it in place, but it will be more secure and reliable if you solder it. First and foremost I wanted to say thanks to Racketboy for a VERY fast shipping turnaround.. Also When I got my mod chip I couldnt get it to work at all,.. Cd’s Would not spin (originals + Cdrs). I thought it might be the A - B connection so I tried the pin connection.. Same result. So I emailed Racketboy and gave em the low down on the problem.. (BTW - the chip was in all the way) He then told me send the chip back and he’d send me a new one.. Sure enough I did, he did, and it works like a charm.. Although I didnt get to try the A - B method again because I clipped the wires from the chip so I didn’t have to solder them to the board again.. Anyways thanks for the fast, customer satisfatory service! i bought some chips from racketboy and a cartidge, i have to say the shipping is extremely fast, four days to arrive to belgium! i modded the chip in order to make it work in my jap grey saturn, guess what, it works , it’s a six years of wait that’s over. thanks to you for selling those chips. You should advertise more the fact they can be modded to run on 20 pins saturn, you should even as the mod is not for begginer sell already modded chips. 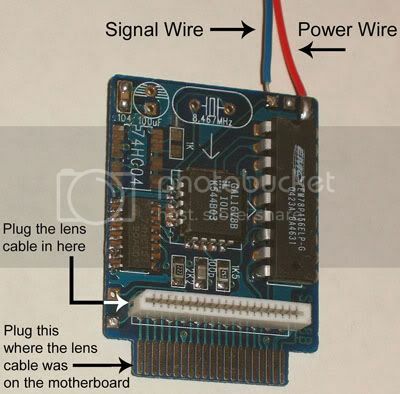 these instructions are a bit dated.. It’s been found that you can just bridge A and B on the modchip with solder, and just connect the red wire to the 5V and you’re done. There’s no need for a signal wire. Hi! I just got a white, round-buttoned JP Sega Saturn, and I was wondering if the mod-chip and above installation instructions would work on my machine. Thanks! If the insides looks like the one in the picture, you’re all set. The region/color of the Saturn doesn’t make a difference. Can i bridge points A>B instead on a PAL system? As someone mentioned to me that it does’nt always work??? I was gonna bridge em’ to make it a bit neater in my saturn. the region shouldn’t matter, but yes. Finally … our houseguests left and I was able to install my Saturn chip this morning. First in the slot was TEMPEST 2000. It was great playing this old favorite without the cheesy old Atari Jaguar. 2. Soldering is a good idea, but if you don’t have the confidence or just don’t want to hassle with it, you can get away with sticky tape! 3. The signal wire can be looped right back into the B slot and taped in place. 4. The power line can be stuck into the power supply without solder if you’re going to be gentle with your system or don’t mind opening it up again if it comes loose. 5. Filing down the sides of the chip to loosen the fit into the motherboard slot was key for me. Thanks to Racketboy for making this so painless and fun! I installed a modchip without much hassle, using the A+B method. 2. fitting the chip was hard. I guess this is why there is the advice of “filing” the edges for an easier fit. I wasn’t sure of where I was supposed to be able to file without damaging anything (maybe that part could be clearer in the guide?) so I just plugged it in eventually. It had to be pushed in with some force, and if you don’t do it properly (with care not to bend it) I can imagine one could snap it in this part of the fitting process, so be careful. installation was pretty easy, i didnt even sodder, i used the A to B method and just inserted the wire from point A into the hole in the circuit board at point B and wrapped a little (1/4 inch) of the wire over board to keep it in place, and the power wire i simply wedge it in nice and secure to soldering at all, only difference i notice is that it takes slightly longer for games to boot. thanks racketboy. hey, i had a quick question. my power link cable came loose from the modchip, i was wondering how to reattach it. Do i need to solder it back on? yup, just solder it back into place. For some strange reason, the mod in mine has to be mounted backwards, so that the laser cable faces towards the outside of the case, and the cable needs to mounted upside down. Its the only setup where the laser will actually move. And the Saturn still goes straight to the audio screen. It won’t play any games, CD-R or proper Saturn games. Any thoughts anyone? wire setup and all works perfect. ps.here’s the link for my saturn version wich is 64pin version. Just received my modchip in the mail today, very fast shipping. Time to install! Mod chip and memory card showed up today installed the chip (no soldering yet) and started testing it. It runs great and the memory card now lets me play my X-men vs street fighter game. Super fast shipping bought the chip on Friday had it by Monday. Installing for a friend, I’m getting the “disc unsuitable for this system error”, too bad he didn’t give me any real games to rule out problems with. Sounds like they are imports that need to be patched. Great chip, fast shipping. Only had to solder the power wire and make a solder bridge between points A and B. The red power wire was a little bit short, but still reached. Hey, Got my chip installing on a model 2 32pin. I got everything in and used the A+B method, soldered at the power point. But when I tried to fire her up afterwards the drive motor would not spin, and even if there was nothing in the drive it said checking disc. After checking for snug connections i noticed the drive open indicator position did not matter it still did it. Long story short 10 mins later I resoldered the A-B connection, and vwalla everything works great. My advice to anyone doing this method is to completely unsolder the wire the comes on the chip and drop a bead bridge between the two for the best connection. hi my name is Carlos and I live in Chile, would you accept western union money transfer as payment? Just got my Saturn Mod chip. I had two failures before getting it successfully working, but that was just difficulties getting the cd cable passthrough properly plugged in. I very slightly filed the edges of the connector and tried again, and it’s all up and running. I used the A->B bridge technique, on a model 2 Saturn which works great so far. For a hardware mod chip, this was about as painless of an install as I think you can get. Looks like my Saturn is back in business! Very cool. Wass Up Racket Boy, I got your chip in today. It took about three day’s, not including new years day, and the day after. I quickly got it working in about 2 hours. I wish the directions would be a little clearer though. I did everything in the guide, but could’nt get it to work. I then looked over the guide a bit more, and in the picture, which I could hardly see, that there were 3 pins,were the wires were going into. I was doing the A + B method. What I did was solder the power wire, over the middle connection then into the signal wire. I soldered all three in to it. I then diagnosed the problem by doing it all over again, reconnecting everything, and doing the soldering again. But I had to Desolder the 3 braids and connect the power wire, then the a+b method solder. Everything is good to go. I almost thought is wasnt working, because I put in a downloaded ISO,and it said “Game Disc Unsuitable for this system.” Then I figured it was a japanese game and did’nt patch the iso. But I quickly burned my U.S Game and it boots FLAWLESSLY NOW. 1) Take out 5 Screws underneath Saturn. 2) Lift out top, and Disconnect Ribbon Cables for drive, and ground yourself. 3)On the chip, desolder the signal wire, and save it. 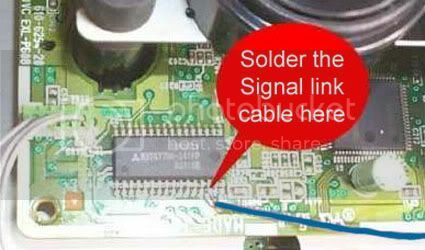 Connect the middle tab to the signal tab with solder. 4) Shave off sides with scissor, the sides that goes into the old ribbon cable. 5) Plug CD Ribbon cable to modchip, then into the Mother Board. 6) Use the extra signal wire and solder it to the end of the power wire. It’s a little to short, and if installed with tension my come out over time. So I just used the signal wire and soldered it the the 5 volt cable. 7) Check to see if it works, and put back case and screws. P.S. Racket Boy, Could I buy the complete U.S. Saturn Game Set? I bought the mod chip from Racketboy, and have now got it working on an Australian Saturn. I initially soldered the signal line to pin 14, but this didn’t work at all (CD spindle didn’t power up and start spinning). I found that when I switched to the (simpler) A+B method it all worked perfectly! I just received my Sega Saturn that I got from eBay (model 2). I had my chip for a few days now so today was the day! I followed all instructions I could find here, then I decided to try it. (Btw, I used the 14 pin method using scotch tape only) When I saw that the Saturn animation didn’t showed anymore, I knew there was something wrong. I tried many things for a few hours, then I thought that there was probably a power problem. I finally got to put the red wire in its place carefully. Then I started my Saturn again, the animation was back! My brother was totally skeptical about all that. I told him: “Believe me, it’s gonna work!” So I patched Radiant Silvergun then burned it. You know what? It works!!! Everything is just fine! Thank you RacketBoy! I know absolutely nothing about electronics and I managed to mod my Saturn so believe me, anyone can! Great mod, fantastic instructions. I soldered to the 14th pin (I couldn’t get the loop option work). Everything works great. Thanks for being the last option out there Now we just need these kind of instructions for the NES 2 a/v mod!!! Hey there I want to buy a Satmod I live in Mexico who buy? Have you any plans to get the Saturn mod chips back in Racketboy? If not does anyone know where a UK gamer and Shining Force 3 lover might find one or a pre-modded Saturn? There is a possibility, but I can’t make any promises. 1. Since I had a 64-pin chip instead of the 32-pin chip on the motherboard, I used the A-B method, just melting the solder already on the contact B and connecting the black wire to it. 2. First time I checked it, I put the mod chip in backwards. 2nd time, I had the lens cable in backwards. Then it worked. 3. It works, but in a weird way. CD-R and real game both boot into the cd-player. After hitting ‘play’ when the songs of the disc appear, I hit reset and the system boots into the game. A little more intricate than I would have liked, but can’t really complain. Guardian Heroes works great. Hey racketboy. Do you have more Saturn Modchips. I would like to buy one more, and pick up another model 2 saturn. How much would you like for 1 more chip and the set of Saturn ISO’s? Please racketboy. i bought one of your chips a while ago but couldn’t get it working. its a 32 pin pal saturn and i connected the A & B points together. the weird thing is that with the chip installed not even originals boot. it only enters the menu where i can play the music that’s on the cd (original or backup). Silviu, have you gone through the suggestions in the troubleshooting page? Rob, yes, I have some at this moment. awesome, ordered one anyway this morning before i read this, can’t wait to put the baby in! I think I’ll buy one when I get paid. Hey Racketboy, do you know how I can get Rocketbeetle (from the segaxtreme.net forums)’s attention. He’s never on the forums and I need to know more about that switch he installed on the saturn. Like what kind of switch do I need and where do I get it? hi, do you still have modchip in stock? Just wanted to let you know I got my modchip yesterday and installed it last night in my Model 2 system. Installation was a breeze, even with what little soldering skill I have. Got a solder line from A->B, had to trim the excess board on either side of the mobo connector of the chip to get it to fit. The power lead was plenty long so there were no worries with that. Worked right away. Thanks! The chip works flawlessly. The power wire was a little too short, but who cares? does this work on a model 1 pal uk saturn? Just wondering if I can still purchase a modchip for my Saturn. I actually own both Models so making sure this site and chip is still available. Hope it is so that I can order a modchip for my Model 2. Will stop back frequently to see if I got a response. Just bought a model 2 saturn and was interested in buying a mod chip for it. Thanks. Awesome, pure awesome! Racketboy is very quick and responsive, and his mod chip works wonderfully! I can now stash my originals away for safekeeping! Thanks racketboy, I will try to buy more from you, though I don’t do ebay at the moment. Thankyou for the chip just brilliant works perfect. Installation was very easy besides trying to fit the chip into the cd lens slot on mobo just ued the blade of the scissors to trim down the sides for a perfect fit. I dont know which Saturn version I have. On the outside, it has round BLACK buttons; does that make a difference? I noticed the circuit board below the lens is a bit different, the 32 pin chip appears to be below the plastic part of the lens. Also, how big is the mod chip? From the pictures and from looking at my saturn it appears too big. If anyone could help me that would be great. For the Saturn, I usually do 4X or 8X. Hi, can you tell me if this modchip will instal/work on a white *import* Saturn? The region on the Saturn doesn’t matter — the main concern is what it looks like inside. I have a model 2 saturn and am not new to the mod sece hace moded plenty of system in past but for some reason this will not work! 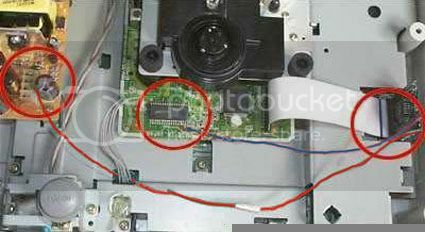 With the chip in the saturn will not even spin up a disk no matter whats in there the lens will not fire anything but take it out an put the ribbon back on its own and it will work fine any ideas?? Thanks for the chip, works perfectly, just definitely could’ve used a smaller soldering tip than the only one I had at home. Now I can finally put the saturn back onto my shelf and play more than Space Hulk…. Thank you so much for being one of the remainder USA Saturn mod chip venders. I appreciate the great response to my faulty chip problem, and the second chip worked flawlessly. It was a pleasure doing business with you and I hope you can satisfy Saturn fans for years to come. Just a notation: When putting solder from point A to B it helps a lot if it is done on both sides. For one reason or another I did it on one side and had no response from the system, but when I applied it to the other side it worked fine. Does it matter which side you solder points A and B together or was it probably just a bad connection on the first try? Whoops I re-read what i typed. I should say I’m convinced it is the SATURN that is broken NOT the memory card from Racket boy. I have installed this on my Saturn w/ relative ease compared to Xbox, Wii, PSX and others and able to play those “games”. I have a question does a modchip exists that allows to play JAP games on a US saturn w/o the 4-1 in cart. Hi mach_six! Nope — there aren’t any chips to take care of regions, but you can patch the ISOs of your games before burning so you don’t need a 4-in-1. Installed within 15 minutes flat, so far works perfect for all the backups I have for my Model 2 Saturn. A way better solution to the swapping disc. I recommend this chip to anyone , and its really easy to install. The shipping took about ten days, pretty good. P.S. you are going to have to slightly file down the terminal of the modchip to get it to fit, but other then that, its all game playing. I just wanted to give a big THANK YOU to racketboy! Your tutorial was great and following everything to the T helped out. Whoever does this make SURE you really push that chip into the slot on the board! That messed me up for a bit and yes, bridging the A+B spots on the chip was much easier than adding a cable to that extremely small 14th pin. Thanks also for the quick shipping and service. If you sell anything else other than the chip and the RAM Expansion cart, I would buy from you. Great help! I´ve just installed a modchip in my sanyo saturn console, the A+B method didn´t work though, but I´ve done the “A to 7th pin of the sanyo chip” bridge and your chip worked flawlessly. It has been a pleasure doing business with you and I am very satisfied with your communication throughout the transaction and how fast the mod chip arrived. The mod chip works great. 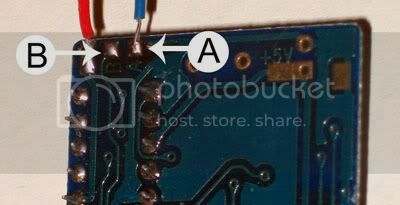 If anyone is doing the signal wire method, I would suggest melting some solder on the end of the signal wire and then soldering it to the 14th pin because this way you don’t have to worry about holding the wire, solder, and soldering iron. It made it a lot easier for me anyway. I have a model 2 32 pin Sega Saturn. Installed the chip with the A-B bridge, and the cd-rom won’t spin up. I get checking disc and 2 green cubes. I read it could be a power problem. Is here another point I can soldier the power to on the chip? Have you tried soldering the signal wire to the chip instead of the A+B method?